Every week on Place to Be Nation, a combination of correspondents review one match from the world of wrestling that YOU as the viewer should seek out! Marufuji’s striking made the match for me. Towards the second half his kick combinations looked great, and I thought Okada was selling them really well. I loved the piledriver onto the side of the apron. I think I would have enjoyed it more if I actually thought Marufuji had a chance of winning. But, Marufuji still did a great job looking like a believable competitor for the champion. I think a “chop duel” makes the most sense at the beginning of a match. It’s like a scene from Roadhouse that I’m about to make up. Terry Funk takes a shot and looks over at pretty boy Swayze, and he dares him to take his best shot. Swayze punches him, but says.. .”your turn.” Funk wipes the blood from the corner of his mouth, and smacks him back. They then trade a few blows before a huge brawl breaks out… They won’t stop to trade open blows after that… Or, I wouldn’t guess so anyway…Funk might – he’s crazy, and in this fictional scene… drunk. Dragon Gate shows are offered via Nico Nico. The service and player is spotty and it is a guessing game as to whether your credit card is accepted (my two main credit cards aren’t), but it is available for most of the major Dragon Gate shows and their Korakuen shows. 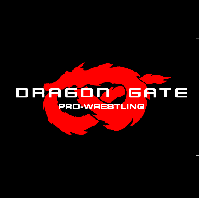 In addition, Dragon Gate is available on the Real Hero google drive. El Lindaman is a fresh member of the main heel stable in Dragon Gate, Verseek. This was the final transformation following his emotional break up with Yosuke Santa Maria. El Lindaman’s cape has corresponded in this transformation and was up for grabs in this match. Eita is the current Open the Brave Gate Champion which is the #2 singles title in Dragon Gate and usually used as a stepping stone for younger guys into the main event scene. Think of it as a Intercontinental Title of Dragon Gate. Eita is a member of the Over Generation along with CIMA, GAMMA, Punch Tominaga, Kaito Ishida, Takehiro Yamamura and Dragon Kid. I came into this nearly dark about Dragon Gate. My only real knowledge into this match is that EITA is widely expected to fill the void of Akira Tozawa who is departing for the WWE. I’m not a regular Dragon Gate watcher so I’m not familiar with what appears to be intricately booked stable wars. Because of the numerous twists that this feud has undoubtedly taken (I think there was a stable defection in this very match!) I can’t really judge this match as a part of a story or as something satisfyingly booked. It’s very clearly a chapter in something ongoing and interesting that I just don’t have the back story on. Instead, I’m going to assess EITA. I’m a sucker for wrestlers that fight in character. It’s a better barometer to me of what makes a “good” wrestler than moveset or pace or anything else. I’ll take a guy that can display emotions and tell me who he is just through his mannerisms over a guy who does a hundred suplexes or backbreaker variations any day of the week. What struck me about EITA was how much of a chip of a shoulder he displayed at all times throughout his initial offensive segment in the beginning. He fought like a guy who’s sick of having to ask for a respect and has just decided to take it. Any schlub can cut a promo saying that he’s sick of being disrespected and is going to just take that respect from now on. It’s another thing to actually show that in the ring and walk that line of intentionally running circles around his opponent without coming off as a heel. Showing you are the best is much harder than saying you are the best. EITA displayed that magnificently. He just seemed to completely outclass Lindaman the whole way through. I don’t mean that as a knock on Lindaman either. When it came time for the heat segment with EITA showing his selling ability, the crowd was emphatically hot and behind him. Dragon Gate’s not hurting for over talent to push, but EITA absolutely should be the guy they make the ace of the future. Lindaman’s new attitude since the situation with Yosuke Santa Maria went down has noticeably gone sour and has aligned himself with the evil Verserk and carries with him a ridiculously sized rope around his neck to express his anger. Eat your heart out Makabe. He faces off against Over Generation’s Eita in a matchup of the really not so far future of Dragon Gate and for Eita’s Brave Gate title. Eita sets the tone immediately planting Lindaman with a blistering superkick. I love when a sudden move starts a match, it’s such a departure from the usual “let’s feel each other out” stuff you see and I personally love it every so often. Eita was clearly hungry for a win, trying to go for the killshot early once again with his El Numero Uno submission that Lindaman was able to squirm away from. I also liked Lindaman displaying his new behavior and suplexing Eita onto chairs outside of the ring and brutally whipping Eita with his rope, he looks to have a killer instinct after being spurned by a potential lover. He’s taking out all his frustrations on anyone and anything he can in an incredibly selfish fashion befitting of a heel. Lindaman’s jawing with crowd was also a nice touch. CIMA was trying to protect his surrogate Over Generation son Eita from Verserk throughout the match, at one point threatening Mondai Ryu with a wrench so that automatically constitutes a better rating for this. Eita/Lindaman started to produce some really great back and forth where not one guy really had the advantage; Eita with some high flying and kicks and Lindaman with his various suplexes and throws. Lindaman then decided to put a direct assault on Eita’s arm and attacked it with ferocity, putting Eita in a rolling armbar. He wanted to soften him up for his patented judo throw (For those who aren’t aware, Lindaman has a very legit judo background) so this strategy made perfect sense in the context of the match. Lindaman seemed to have this won after a barrage of suplexes on Eita, and underhooked him for a Tiger suplex but Eita used the ropes to counter. Dr. Muscle, the wildcard of all this on the outside, came up on the apron with the Verserk briefcase, appearing to want to hit Eita to help Verserk. After a few waistlock switches between the two, Muscle smashed Lindaman with the case allowing Eita to hit his Hidalgo (a double underhook piledriver) on Lindaman for the win. In the context of Dragon Gate, the finish is to drive more speculation on who Dr. Muscle is this time and who he really is working with. People who aren’t following DG may not love the ending to this one. I thought the match was good, nothing spectacular but definitely a fine showcase of how these two youngsters have improved in a small sample size. It was a shorter, compact Dragon Gate singles match that got its point across about Lindaman’s scorn and furthering the overall feud between Over Generation and Verserk. First of all, thanks to the PTB overlords for inviting me to join the Match of the Week Club. Faithful reader, the club facilities are of a higher calibre than you might imagine and the guys put on a wonderful spread. Given this is my first contribution to the column it’s probably not wise to admit ignorance, but it looks like I’m going to do so anyway. Perhaps that’s even an interesting perspective. So, if you’re someone like me who seldom dips a toe into the world of Dragon Gate, I’d suggest this isn’t the match for you. Chad and Timothy provided some very helpful background to the match, but despite being armed with that information it was clear from the beginning that I was missing a lot of the necessary context. It’s worth mentioning that Eita, who is slight even by Dragon Gate standards, is someone I’ve watched and been impressed by before now, and while the story of the match was largely lost on me he proved a compelling focal point. His matches with Akira Tozawa and with Jushin Liger in the Super J-Cup 1st Round earlier this year piqued my interest, and his intensity, pace and palpable desire to win stand out in the frequently indistinct flip-flopping world of junior wrestling. Ultimately, this will be best enjoyed by those who regularly watch the promotion, and while I’ve seen many Dragon Gate matches that stand alone and are suitable for newbies, this wasn’t one of them. In future I intend to give star ratings, but on this occasion it doesn’t seem fair. And now I’ll hand you over to some people who know what they’re talking about. This match is all about El Lindaman showing off how much of a heel he is now that he has been slighted. Lindaman distracts the ref by just pointing at Over Gen on the floor so he can whip Eita with a rope in what is my new favorite spot of 2016. They play up the heat for a long time letting Lindaman really show off his new dirty tactics. The match unfortunately break out into a wrestling match where Lindaman shows off his great judo throws and submissions while Eita does the same with his speed and striking. This is really a solid coming out party for Lindaman dark, I’ve been a fan since he first started getting the chance to show off his shooter background. Eita desperation while selling in submissions and blocking suplexes really puts Lindaman over the top here as he now looks like a legitimate threat. The finish is a little wonky as the face Eita wins from interference from the mysterious Dr. Muscle. I am fine with this as I see it as a tease of hint to the reformations of one of my favorite tag teams/factions in Dragon Gate, Muscle Outlawz. Post match promo from Eita and Lindaman feels real and heated to me a big time departure from the fun time goofy stuff Lindaman and Santa Maria were doing just recently.